To determine how much memory (also known as RAM) is in your computer, open the System window. To open the System window and view your memory, press Win+Break on your keyboard. See the following figure. Review the System window to determine how much memory is in your computer. The amount of memory appears right beneath the type of microprocessor (processor) that lives in your PC. 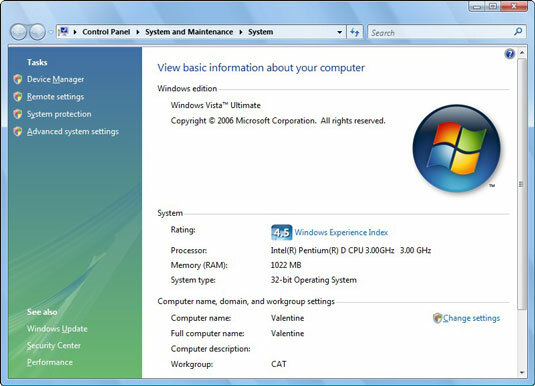 In this figure, the System window shows that the computer has 1022MB of RAM. Close the System window when you’re done checking your PC’s memory.